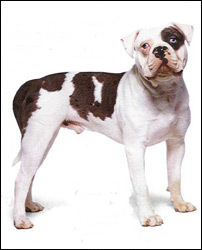 The Alapaha Blue-Blood Bulldog Association (ABBA) is the official founding registry and breed club for Alapaha Blue-Blood Bulldog in the World. This type of dog was in danger of extinction until a small group of Southerners in 1979 in an attempt to rescue the Old Tymey Plantation Bulldog of the South founded the ABBA giving it the aforementioned name and dedicating them to preserving this exceptional type of dog. They set about to perpetuate the breed and to establish a standard in which to breed from. For the past 30 years, the ABBA has been the sole Alapaha Blue-Blood Bulldog registry/club in the World and it’s through the hard work, dedication and passion of its members that the breed thrives today. As American as Apple Pie, its survival will depend upon the strict breeding practices of future fanciers. Originating from working English bulldog stock, first brought over by America’s early southern settlers, there is much to be said of this breeds unique heritage. This dog's ancestors functioned as cattle and pig herders, but the Alapaha Blue-Blood Bulldog is mostly bred now for family protection and companionship. Tenacious, elegant and aloof; this independent yet loyal breed is responsive to training when properly socialized as a puppy. The Alapaha enjoys the companionship of family and it will undoubtedly be the most affectionate guard dog you'll ever own. We've worked to design a site that will be a resource for people who may be interested in bringing an Alapaha into their home, as well as a resource for our club members. If you are new to the breed, you will discover we are friendly folks with a deep love for our breed. Our hope is that every Alapaha born will find a lasting and loving home. The best way to achieve this is by giving you accurate information about all aspects of the breed. Please stay as long as you like and come back as often as you wish, and if you have any questions or comments, please contact one of our ABBA Board Members. The ABBA is a group of people who love the Alapaha breed and as such, we understand that by helping new Alapaha owners, we help the breed in doing so. We are here to support and disseminate information which is pertinent to those in the Alapaha Blue-Blood Bulldog world. You can help by sending in articles, pictures, news clips, suggestions and comments. They are always welcome and by doing so you will help the Alapaha Blue-Blood Bulldog community to educate and prepare itself for the future. Your input, support and involvement are necessary for our continued success. Please send all info to: info@alapahabluebloodbulldogs.org or ABBA, Post office Box 3284, Quartz Hill, CA 93586-3284, (661) 264-4752.